Commissioner Loretta Smith filed a tort claim notice Tuesday, calling for a cease and desist of Multnomah County’s investigation into complaints against Smith, made by two of her former employees. 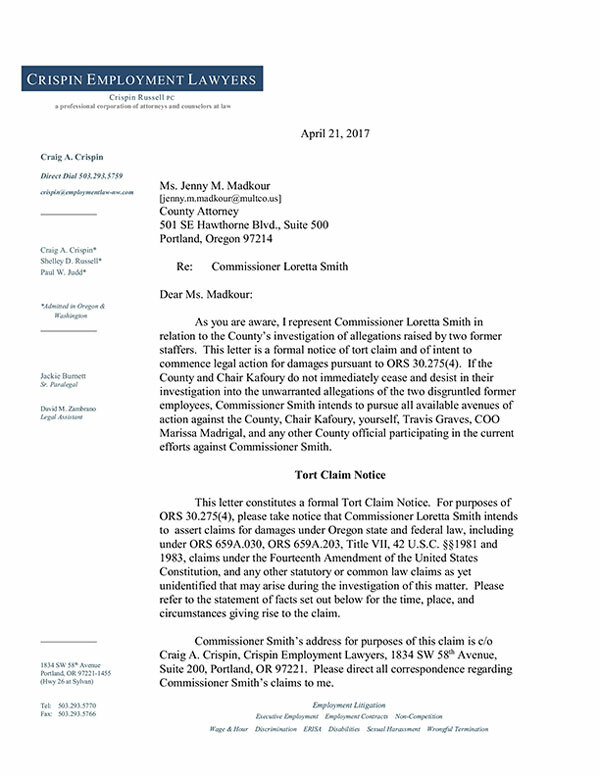 The tort claim, obtained by The Skanner, explains how Commissioner Smith intends to pursue all available avenues of action against the county, Chair Deborah Kafoury, and any other county official participating in the current efforts against Smith, if the investigation does not come to an immediate end. “We continue to have ongoing concerns over the disparate treatment provided by the county in personnel matters involving African Americans, whether those persons are the subjects of an HR investigation or are accused of some kind of misconduct,” reads the tort claim notice, filed by Smith’s lawyer, Craig Crispin. The notice comes on the heels of a settlement agreement that was reached with Smith’s policy advisor, MeeSeon Kwon, two months after she made potentially damaging allegations against her boss. On April 5, the county agreed to pay Kwon $23,820, which includes attorney fees, plus six months’ administrative leave. Her resignation is expected on or before Sept. 8, 2017, as stated in the agreement. The settlement was the result of Kwon’s Jan. 22 email, published by the Willamette Week in February, in which she claimed Smith had used county resources for her personal campaign events, and then asked staffers to sign non-disclosure agreements. For a public official, it’s a move that raises ethical and legal questions. A week later, Saba Saleem, who worked for Smith in 2014 and 2015, came forward with her own letter backing Kwon’s story of the commissioner’s mistreatment of staff, Smith’s cycling through seven chiefs of staff in six years, and her use of public resources for personal gain. 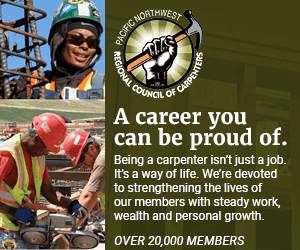 Yet despite the recent settlement, the employee’s accusations continue to bear weight on Smith, who is only the second African American to serve as a Multnomah County commissioner. “A human resources investigation into (Kwon’s) claims is ongoing,” Julie Sullivan-Springhetti, communications director for Multnomah County, told The Skanner last week. She asserted that Kwon’s claims have not been substantiated by the county attorney’s office. According to Smith and Crispin, the external investigation currently being carried out is a tactic by County Chair Deborah Kafoury to undermine the commissioner politically and malign her reputation. “(Kafoury) thinks I’m going to run against her,” said Smith, referring to the 2018 primary election when the Chair seat will be on the ballot. In recent years investigations into county officials have not been uncommon. In 2016, Kafoury opened the books on Sheriff Dan Staton over alleged workplace violations and threats of force and violence. To Kafoury’s disappointment, the Department of Justice concluded no criminal wrongdoing on the part of Staton. Phillip said he believes in a historical pattern of subverting African Americans elected to office. He recounts the deep water Gladys McCoy found herself in as the first Black chair of the Multnomah County Board of Commissioners, a position she held from 1987 until her death in April 1993 at age 65. McCoy’s efforts to increase the number of minority contracts in the county were curbed by the board, which claimed her motives were illegal under Richmond vs. Croson. In 1974, Charles Jordan was appointed Portland’s first African American member of the city council. As police commissioner, Jordan had been pushing for law enforcement accountability. After he fired two off-duty officers for dumping dead possums outside a Black-owned restaurant in Northeast Portland, then-Mayor Frank Ivancie demoted Jordan from the police bureau. Smith has made no official announcements about her political trajectory; but her work for U.S. Sen. Ron Wyden could be a signifier of campaigns to come. UPDATE: Shortly after this article was published, Chair Kafoury provided the following statement to The Skanner: "We are going to continue the investigation that the commissioner originally requested because we have a legal and ethical obligation to our employees and the public to determine the facts."